Purchasing a home, at the basic level, is relatively the same no matter what state and city you buy in. Tour properties with a realtor, pick out the one you like the most, submit an offer, have a home inspection done, and hopefully in a month or so, you have a new place to call home. It’s always an exciting process that is almost guaranteed to stress you out. Buying a home is the likely the biggest and most expensive purchase you’ll make, so it’s one that should be considered thoughtfully and carefully. Because there are so many moving parts, it’s easy to get lost in it all and forget to ask the right questions, and work with the right people. Cape Coral has two main points that make it different from purchasing in most other cities. Understanding how these work is a key component in making an informed decision on where and when you want to buy while saving you time and money. The city of Cape Coral has quickly become one of the most moved to cities in the United States. If you’re trying to check coastal waterfront living, amazing weather, recreation, safety, and a growing economy that’s still affordable off your list, Cape is a top choice. Most cities throughout the US that can offer accolades like this are typically expensive or overcrowded, so the “hidden gem” that is Cape Coral is quickly moving it’s way to the top. In the early days, Southeast Cape was the first to develop and city water and sewer areas were minimal. As population increased, so did the demand for utility expansion. Fast forward to present day, it is generally known that homes south of Pine Island road already have city water and sewer, and everything north is on a well and has a septic tank. The septic tanks are dug deep in the front yard that hold waste and need to be pumped out every few years. For water, a pipe is drilled, sometimes as deep as 300 ft to reach the Florida ground water beneath the limestone. This water is usually unpleasant as it is loaded with sulfur and minerals that make it stink and leave a lot of residue behind after drying. Expensive equipment is required to pump the water up, refine it to a somewhat desirable smell and color, and finally can be used in the home. Maintaining the equipment is essential to keeping the water usable. The upside to well water is it’s free! 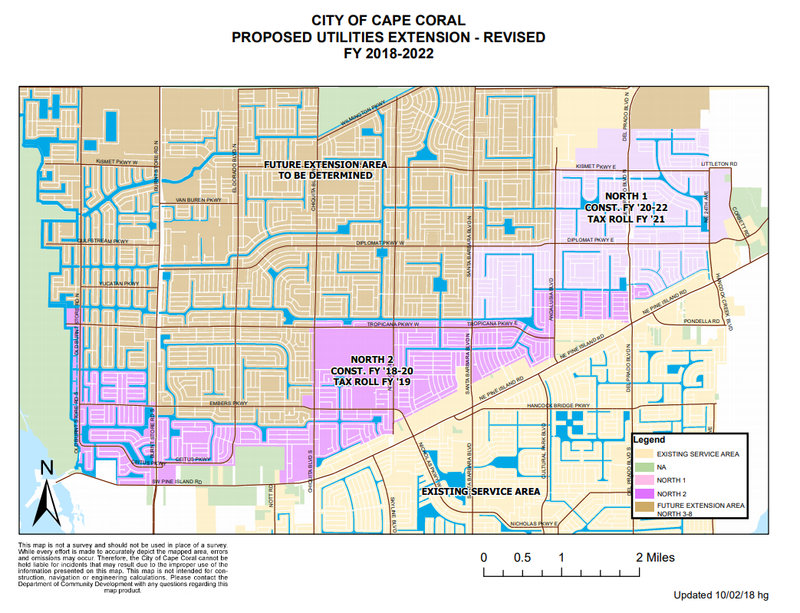 However, as the population has increased in the norther quadrants of Cape Coral, the city has decided to move city water and sewer northward. As of the time of this article, the areas in pink are completely torn up. Most roads have been removed and residents are dealing with an absolute nightmare with their commutes. Home owners are being assessed tens of thousands of dollars to pay for the project. Most are unable to afford the cost out of pocket, so the bills are put into monthly payments via taxes. For more information on rates and dates of expansion, visit the city’s website here. How does this affect home buying? People looking to purchase homes in these expansion areas need to be aware that all assessment costs will be transferred to them from the current home owner. This means a higher monthly mortgage payment. When looking at homes, simply providing your lender with the address will let them research what the balance of the assessments are so they can calculate your payment. It can make or break your budget, so be sure to ask! Most of north Cape is set to be completed in the next few years, so this will affect everyone at some point, so be prepared to assume the assessments! Not only does this affect future expansion areas, but a large percentage of homes in the “existing service area” STILL have assessment balances attached to them as well. That’s why it is important to check any home listing to see if there is still an assessment balance tied to the property. Although the city makes it clear the best and most accurate way to check the balances tied to a property is to email them directly at payoff@capecoral.net, but for quick reference, you can visit this link. Click run report after you have searched a subject property, and the balances will pop up. Southwest Florida is a subtropical climate with heavy rains throughout the summer mixed with fierce hurricanes. It’s no secret that these deadly storms bring catastrophic amounts of rain and wind that leave areas several feet under water while storm surges pose even graver danger. The zones circled in blue are low risk areas where insurance costs will be low or negligible. 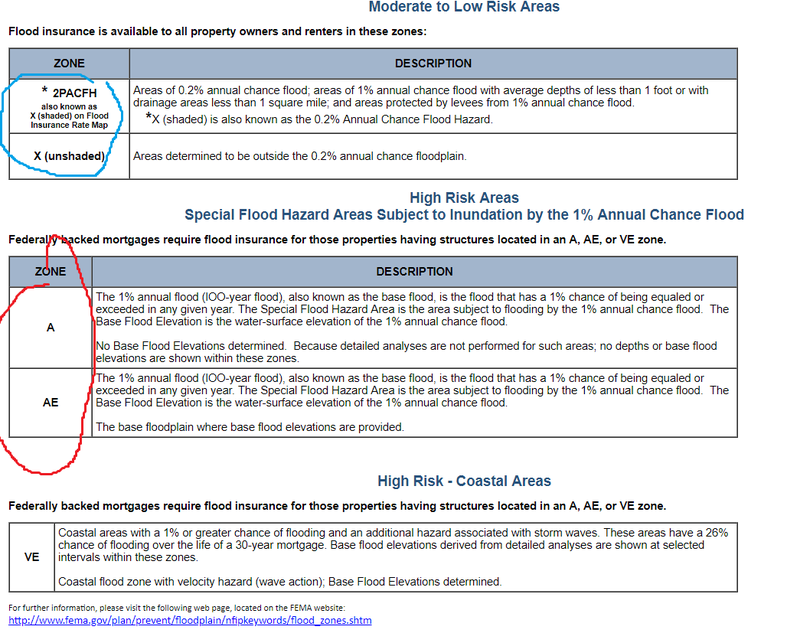 The zones circled in red are high risk, and will have a large impact on your monthly mortgage payments as flood insurance can cost over a thousand dollars a year! Lenders will look these zones up and calculate the extra insurance costs and factor these into your monthly payments so you can determine if the payment is affordable. Have Someone do Your Homework for You! This may seem like a lot for any newcomer or unfamiliar home buyer in Cape Coral, but it’s still good to familiarize yourself with these two big potential issues before setting out and looking for your next place to call home. The best defense against making a mistake in purchasing a home in an area that isn’t right for you is to work with trusted and experienced real estate professionals and lenders that can help guide you to a property that works best for your budget, plans, and desires. For all things real estate, keep it here at Douglas Realty. We’re always a phone call away to help!